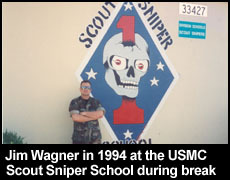 Although Jim Wagner was never a Marine, he is well versed in United States Marine Corps training and tactics and was part of the “Marine culture” from 1991 to 2001; a solid decade. 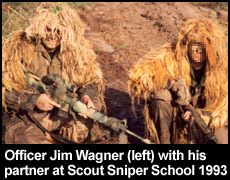 It all started in October of 1991 when Officer Jim Wagner, a police officer with the Costa Mesa Police Department, was invited to Hike Stalk Shoot’s first sniper and counter-sniper training event, named By Dawn’s Early Light, near Victorville, California out in the desert. 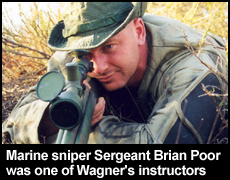 Officer Wagner was assigned to a Marine OPFOR (Opposition Force) that had seen action in the Persian Gulf War (Operation Desert Storm). As the only civilian assigned to the team Officer Wagner learned small unit patrol tactics. 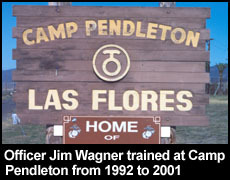 In 1992 Jim Wagner's police patrol partner (Area III), also a police sniper on the Costa Mesa SWAT Team, hooked up with Division Schools at Camp Pendleton and made friends with many of the instructors there. By this time Jim, his beat partner, and two other police officers, were running the sniper club called Hike Stalk Shoot. The Marines at Division Schools were so impressed with the police training that HSS was offering that the instructors at Scout Sniper School under Sergeant Parisi invited Jim and his partner to Marine courses in exchange for police SWAT training for their personnel. This was a partnership that was to last several years with dozens of Division Schools instructors. 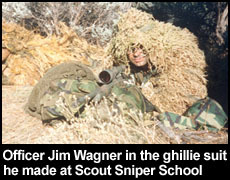 Officer Jim Wagner, who had the goal of becoming a police sniper on the Costa Mesa Police SWAT Team, participated in dozens of Scout Sniper School courses: ballistics studies, stalking exercises, camouflage making, and live-fire training on static and moving targets; shots up to 800 meters away. 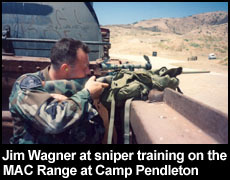 From January 3 to 5, 2004 Officer Jim Wagner attended the Advanced Sniper Course taught by Scout Sniper School at Camp Pendleton. This course was taught by Sergeant Parisi, Sergeant Brumbaugh, Sergeant Williams, and Sergeant Brian Poor. 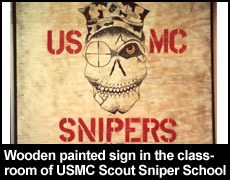 These were the main instructors of Scout Sniper School at Division Schools. 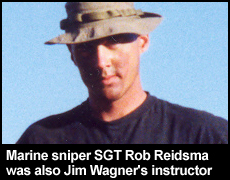 Jim latter hired Brian Poor to teach several HSS International courses and also produced a training video titled Extreme Angle Sniper Shooting under Jim's second company called War Arts. On February 11, 2004 Officer Jim Wagner received a Letter of Appreciation from First Lieutenant T.C. 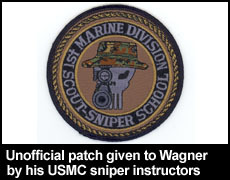 West of Scout Sniper School, Division Schools, 1st Marine Division for his "time and assistance on numerous occasions to help coordinate, participate in, and evaluate Sniper training scenarios and courses that incorporate realistic application to both law enforcement and military personnel." 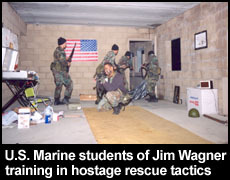 Although Jim Wagner was not on the SWAT team at the time, it shows how much respect that the Marines had for him as an instructor who could take what that they had taught him and then turn around and create realistic scenarios for them. Of course, that is one of Jim Wagner's true talents, looking at any fighting system and making it more effective, and coming up with new techniques and training methods. 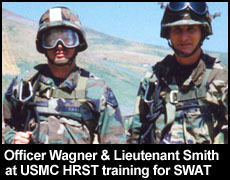 On March 11, 2004 Officer Jim Wagner was placed on the Costa Mesa Police SWAT Team. His position of Command Post Operations Officer required scouting out hostile targets and gathering intelligence for reporting and tactical diagrams. 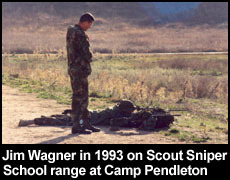 Officer Wagner's training with Scout Sniper School played a key factor in him landing the position, and he was sent to even more sniper courses at Camp Pendleton paid for by his department. SWAT Officer Jim Wagner received extensive MOUT (Military Operation Urban Terrain) and HRST (Helicopter Rope Suspension Training) training from Sergeant Ekhoff and other instructors of Division Schools. 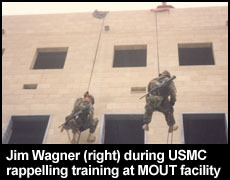 At the MOUT facility SWAT Officer Jim Wagner was taught how to conduct military operations in a built up area: team movement, street fighting, building assaults, and even tactical rappelling from roof tops into windows and openings on buildings up to five stories high. SWAT Officer Jim Wagner also had the opportunity to train in Special Purpose Insert Extraction (SPIE Rigging). This is training reserved primarily for Special Operations operators. 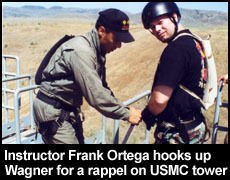 Operators, who are wearing harnesses, attach themselves to a single line, which in turn is attached to the bottom of a helicopter. The helicopter can then pull the team out of an area where the aircraft is unable to land. The opposite is also true where a team can be lowered into an area where the aircraft cannot land. Jim’s own SWAT Commander, Lieutenant Ron Smith, participated in this training. SWAT Officer Jim Wagner also went through the three-day Range Safety Officer (RSO) course through CRCF Longrifle (FM 30.35/49.00). This training was a hands-on live-fire course that included small arms qualification and demonstration of tactics, hand grenade training, and range safety procedures. 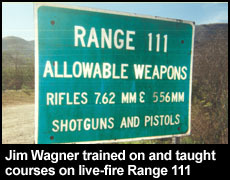 During one of the nights Officer Wagner, armed with a Marine M-16 rifle, had to pull guard duty with a fellow student guarding crates of ammunition and explosives from sundown to sunup at the MOUT facility at Camp Pendleton; a duty Officer Wagner had not done since he was in the Army back in 1980. 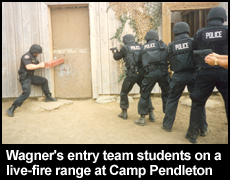 Upon graduation from the course Officer Wagner was qualified to run hot ranges for police and military training at MCB Camp Pendlton. SWAT Officer Jim Wagner received Marine pistol training from Sergeant Julio Garcia at Camp Pendleton and Sergeant Bill Skiles on a police range in Ventura. 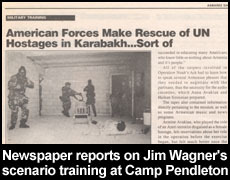 On February 13, 1995 Jim Wagner was in charge of an 18 hour Special Operations training event titled Caucasus Conflict involving soldiers of the 19th Special Forces Group (U.S. Army National Guard), the 1st Marine Division Schools, and a dozen federal, state, and local law enforcement agencies. 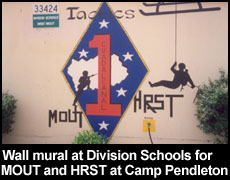 Division Schools allowed Officer Wagner to recreate the Azerbaijan-Armenian War at the 27 acres, 30 building MOUT facility at Camp Pendleton. This war involved the Christian Armenians and the Muslim Azeris; both break-away republics of the former Soviet Union. The actual conflict took place in the Nagorno Karabagh region of the Transcaucasia. Officer Wagner was allowed to turn the small town into an Armenia village complete with street signs in the Armenian language, posters, and authentic paraphernalia. He also recruited a dozen Armenian-Americans from Los Angeles to play various roles speaking in their native tongue. They were not allowed to speak English during the exercise. The southern half of the village was occupied by Azeris and “Iranian military advisors” played by members of the 19th Special Forces. The "bad guys" wore Iranian airborne patches on desert camouflage fatiques and carried blank firing AK-47s. The village had national flags of these warring factions scattered about, and the Muslim call to prayer was played five times a day on loud speakers. 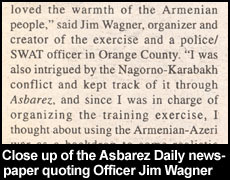 Jim Wagner said, "Although there was no proof at the time that the Iranians were involved in the Nagorno Karabah conflict, I had my suspicions that they were due to the shared border between Iran and Azerbaijan, and the fact that Iran was openly pro Azeri. I knew that we would be having trouble with the Iranians in the years to come, which I was proved to be right, and I thought it would be good training for American troops to be exposed to this region of the world. To my surprise the Marines let me do it. When anyone drove up to the main building of the MOUT facility the first thing they saw was the Armenian Nagorno Karabah flag on the flag pole. I received a lot of compliments from that training exercise." 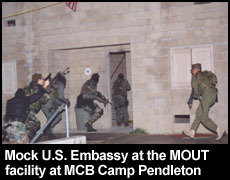 The purpose of this grandiose scenario was to infiltrate Special Operations operators into a war-torn foreign village in order to rescue United Nations observers who had been taken hostage. Teams were required to rendezvous with pro American operatives on the Armenian side who would give them information as to the whereabouts of the hostages. The teams would then have to rescue the hostages from Iranian interrogators. 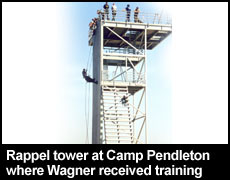 Word of Wagner's realistic scenario spread quickly through Camp Pendleton and the 1st Force Reconnaissance Company sent observers to watch the training. The training involved up to 100 participants. 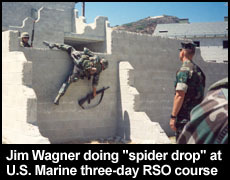 The event turned out to be such a success that the Marines allowed Officer Wagner to set up another full-scale scenario on November 2 and 3, 1996 called Operation Hurricane. Operation Hurricane was a training exercise patterned after the U.S. Army Q-course, only it took place in the fictitious South American country of Paracas; a creation of Jim Wagner. "This time I stayed away from using real countries as the backdrop of my scenario to keep the Marine Corps from getting into any trouble. Although nobody had complain about my last exercise in 1995 I didn't want the media getting a hold of this and making it sound like it was the government's idea, so I played it safe" Jim said. The exercise was the United States invasion of the fictitious country of La Republica de Paracas. This low-intensity conflict began over the denial of shipping rights in international waters off of the coast of this tiny, island nation, but was actually a convenient excuse to destroy this country's top secret COIL (Chemical Oxidation Iodized Laser) weapons program, and to capture alive the dictator of this renegade country – General Fidel Gamboa. Law enforcement entry teams and military combat units were assigned various missions by Jim Wagner in this non-stop, 16 hours, exercise: destroy a clandestine weapons lab, extract General Gamboa, make a hostage rescue of two downed Marine F-18 pilots, and a second rescue of U.S. Embassy staff members in the center of the capitol city. The training not only included scenarios using blanks, but live-fire training as well. Again, Jim Wagner went all out by placing Spanish street signs throughout the MOUT facility and recruiting Spanish speaking actors. Wagner's reputation as a premier police and military trainer was certain after this event and word of his talents spread across the country and even internationally. 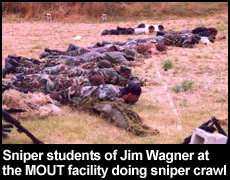 Jim Wagner would also provide this kind of training to German counterterrorist Team GSG9, the German Federal Police Academy, and the Finnish National Police Academy. When HSS International started running maritime courses in the Port of Los Angeles many U.S. Marine instructors got involved like Sergeant Frank Ortega and Sergeant Tom Love. From Sergeant Ortega SWAT Officer Jim Wagner learned how to cast from speed boats. Casting is when a tactical operator roles off of the side of the gunnel or from the stern of the watercraft when it is moving in order to avoid detection from distant observers. From Sergeant Ortega he also learned tactical swimming, drown proofing, hydrographic mapping, coastal assaults, and water dangers. From Sergeant Love Officer Wagner learned tactical swimming, SCUBA assaults, water navigation, boat assault tactics, ship assault tactics, and Gas & Oil Platform assaults. 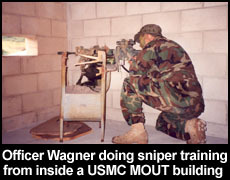 Of course, other instructors contributed to these courses, but Officer Wagner did not keep records of these Marines or the records have been lost over the years. Once Officer Wagner was comfortable with the material that had been taught to him, and added his own teaching expertise, Sergeants Ortega and Love had Jim Wagner assist them in other maritime courses. 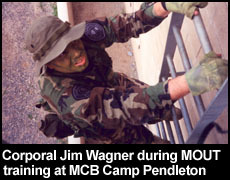 SWAT Officer Jim Wagner also trained various Marine Provost Marshal (military police) Units from Camp Pendleton, Miramar Naval Air Station, and Yuma Air Station. He also trained Marine Close Combat instructors at Whidbey Island Naval Air Station. With these groups Officer Wagner taught his own combatives and Knife Survival courses. After the terrorist attacks on the United States on September 11, 2001 Jim Wagner's life took a new direction and he focused on counterterrorism, and then later formed his own martial arts system called Jim Wagner Reality-Based Personal Protection. His involvement with the Marines stopped, and new Division Schools instructors stepped in who did not know Jim. Reflecting on this time Jim said, "I still get a fair number of Marines coming through my Reality-Based courses, and I am honored when I do. From time to time I will also get a Marine in Iraq who will order my Reality-Based Blade made by Boker. I look back at all of the training I did with the Marines and I am deeply grateful for everything they taught me. Although I was never a Marine I have strong emotional ties to the United States Marine Corps. I've been in the air with them, in the water with them, and through the brush with them. I've been there when the new Marines were going up Mount Mother in the crucible all chanting at Camp Pendleton, and I've stood there in formation with a bunch of Scout Sniper School students getting yelled at along with the rest of them. When I hear the Marine Corp anthem I feel that I am touched by it as much as any Marine could be. In return for the training they gave me I helped train many of them, and thereby contributed to the security of the United States of America."